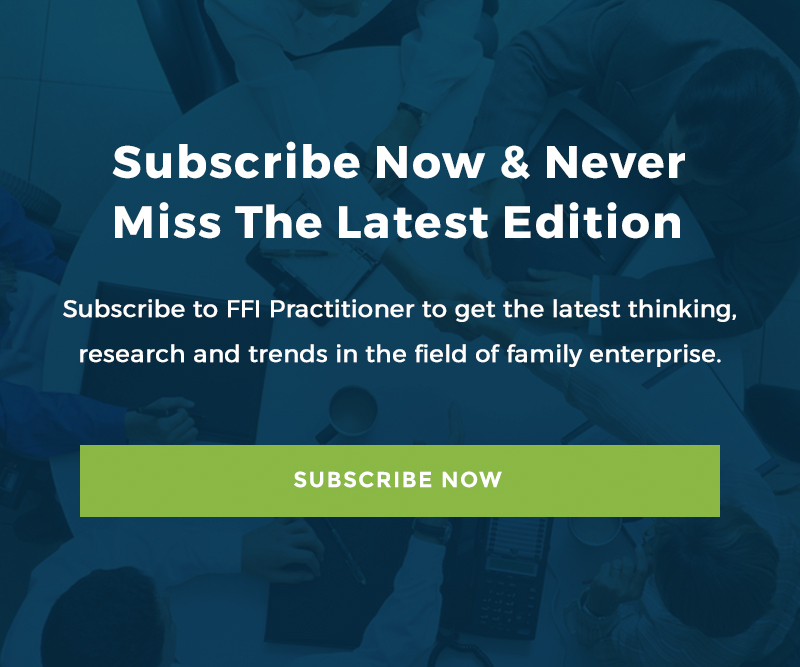 Russell Haworth (RH): Hello and welcome to this week’s edition of FFI Practitioner, a publication brought to you by the Family Firm Institute. I’m Russ Haworth, and for this week’s edition I speak with Mark Bagnall. Mark is a British actor of film, television and stage. He’s starred in numerous feature films and television programs. A skilled stage performer, Mark employs comedy, narration and improvisation in his live work. Mark will be the artist-in-residence for the 2018 FFI global conference, which is being held in London from October 24th to the 26th. Mark will be running a number of workshops designed to help us learn from the disciplines and skills required by an actor. I speak to him about what we can expect from his sessions in October. Mark Bagnall (MB): Hi, how you doing, Russ? RH: Very good, thank you. Now Mark, you’ve worked in the West End, on TV, with children and adults of all ages, but it must be a bit of a new gig for you to work with advisers to family enterprises. Exactly what do you think your not-so-average lawyer, accountant, consultant, or academic can learn from the disciplines and skills required by an actor? MB: Well, you’re completely right, it is a new gig for me. Working with that sector of people. I’m more used to working with actors or enthusiastic young people. But, I think acting is very much the study of people and the study of character, and I think that’s something we all come across obviously in our day-today lives. And if you are in the type of job where you’re working with people and you’re communicating with people, you need to have certain people skills that are going to be right for the situation, and also for that particular situation, because all situations are different, slightly nuanced in a different way. RH: Fantastic. Earlier this month, I attended a workshop that you held in London for FFI members, which was entitled “Thinking on Your Feet When Working with a Family Enterprise.” How do you think that helped people in brushing off those improvisation cobwebs and sharpening up their processing speed — and discovering new learning curves in those tricky consulting moments? MB: Well, it was a fascinating workshop. Actually fantastic. It reminded me, as everybody sort of walked in that, as you said, they’re a very different clientele to what I usually work with. They walked in from a hard day’s work, and they’re in their suits and their ties and their business dresses and their briefcases. And yet, there’s still those same sorts of first-day nerves and those nervous qualities that came into the room. Still very much what I see whenever I work with new people. I thought it was really interesting watching some clearly very successful people in their own field, you know, be thrown in at the deep end and taken out of their comfort zone, really. I think that’s an important thing to do every now and again — to be taken out of your comfort zone — because it can strike you when you least expect it. RH: Yeah, I agree that the workshop, as you said, in the first 30 minutes or so did feel very much out of the comfort zone. But in a safe environment, we were all doing the same exercises. So, it wasn’t as if you were being singled out to say, right now, you do this and to make people feel uncomfortable. We were very comfortable within that environment and as it progressed on, I certainly found myself really getting into the characters. One of the improvisation scenes that you’d set for us was to imagine a customer and business vendor relationship where the price of our regular meal has gone up by a pound. And, I remember getting quite upset at this price rise. In that environment it was great to be able to explore that side of a character and to, as you say, sharpen up the improvisation because you have no idea what the person opposite you was going to say because they are acting this out as well. MB: I think you make a very good point, that’s very key to me, is that nobody is placed on a platform and told to perform or what to do. So, I think it’s very much everybody’s in this together, and I make a very big point that you’re working on the same stuff, that you can work at your own speed. And so those that feel a bit more confidant, the room is there for them to elaborate more, to be more adventurous in what they’re doing. And if you’re still feeling your way around what you’re doing, then that’s fine as well. You can stay in that little pocket and push yourself at your own speed. But I think that’s a very important element that you mentioned — that everybody’s doing the same exercises and so nobody should feel ostracized or that they’re being more watched than anyone else. RH: And the other side effect that I think happened –it brought everybody in the room closer together as well because of that shared experience. You know, we were strangers, some of us coming into that room, but by the time we left it, we’d had this fantastic experience of improvisation for I think an hour and a half or so. And you know the energy and the buzz in the room was fantastic as a result of that. And I know people may be nervous about that kind of thing if it is out of their comfort zone. But by the end of it, everybody felt this kind of uplift in their mood because we’d all gone through this fantastic experience. MB: Yeah. I think that was very evident in the room, and you could see everybody felt that and no matter how silly some of the improvisations were –and they were silly –they’re designed to be silly. There’s a lot going on in those improvisations as well and stuff for people to take away -how they felt they attacked a certain improvisation. And so, I really hope that the people left that room feeling a sense of achievement. That’s really important to me. And I hope they felt that because I certainly felt that from everybody that participated. MB: Well, don’t keep reading those legal briefs! No, actually you should, whatever works. I totally recognize that everyone is on that line of whether they’re brave and adventurous and they feel uber confident — or some people feel more nervous and shyer. As I said, I like to set things up so that people can move at their own speed and express themselves at their own level and everybody, I hope feels stronger by the end of the workshop, but some will take bigger strides than others. But I think the important thing is, it’s about taking part and I think it’s about giving everything a go. And I say this to the younger students that I teach and to the older students I teach is that, you know, we can’t all be incredible at everything. We all have our own skill sets, but something we all can do is just give it your best shot, give it a go. RH: Yeah, and I think having experienced it that there were some no’s at the outset that “what is this actually going to be?” But within the first couple of minutes with the exercises that you do — and it’s important to point out that you’re doing them as well –you’re not standing there pointing saying, well, come on, everybody do this; you’re doing them, we’re following you. It is fun. It is something that you look around the room and you think this is incredible because these people, as you say, have come from their day jobs and shirt and tie or business dress and briefcases and then we’re all in this room talking to each other using “la” as the only word we can use to express how we’re feeling with each other. Which, when you sort of speak about it initially, you think how does that happen? But when you’re in that moment and you’re enjoying it, it’s a fantastic experience. MB: I do certainly think that in a way, and I said this at the workshop, there’s no wrong or right id you believe in what you’re doing. If you believe what you’re doing is the best you can do and what you believe in, then you can’t be wrong. It’s your way of doing this. It’s your interpretation. And as you say, one of the exercises was having a conversation just using the word ”la.” And in many respects, you can’t go wrong with that! Even if you just stand there and go “la, la, la” and then you can build upon that. And it’s those initial steps. And actually, I think everyone in that room started to think, no, I can do this. I can add a little bit here. I can change that slightly. I can add another level to that. And so yeah, it was great to see. It really was great to see at that workshop. RH: And the other important aspect I took away from it was the importance of body language because only being able to communicate using the word “la” meant you had to find other ways in order to communicate how you were feeling or what you’re trying to convey. And body language became a huge part of that. And I think that’s something that I took away from it that is an additional bonus to the improvisation and going out of your comfort zone. MB: And I think it’s something we pay little attention to — certain gestures and certain ways that we sit and how we hold our arms and what we do with our hands. They’re always giving out messages. They’re always sending subliminal messages to the person we’re speaking to. I sometimes wonder if we’re very aware of that. Do we look closed off, do we look like we’re open and engaging? And once you strip away the words, those, as you say, those hand gestures and that body language become super important. And that actually is saying a thousand words in just one gesture. RH: Well, I for one am very much looking forward to the workshop at the conference in October. Thank you for coming on and giving us a bit of an insight as to what to expect, and we’ll look forward to seeing you there. MB: My pleasure. Good to speak to you. Mark Bagnall is a British film, television and stage actor. He has been in numerous features films and television programs including The Bill, Doctors, Casualty, Holby City, Robin Hood, and Midsomer Murders. A skilled stage performer, Mark employs comedy, narration, and improvisation in his live work. Mark is Artist-in-Residence at the global conference in London and will be “acting out” throughout the conference in sessions and in unexpected places! He can be reached at [email protected]. Russell Haworth is a chartered financial planner with Proposito Financial Planning and a family business consultant based in the UK. He is the host of The Family Business Podcast which is part of a wider educational and support initiative for family businesses from The International Centre for Families in Business. He can be reached at [email protected].